You can use this website to download freeware applications (see links below) written by G. Mashanov (The Crick Institute, UK). This software was developed for the detection/tracking, analysis, and modelling of single molecule dynamics (movement and binding kinetics) in live cells, but it can be used for other purposes. You can download our real and simulated data samples and ImageJ Plugins to import and export your data files. 1. Download required .zip file (see below). The archives contain ".exe" files (32 or 64 bit), and corresponding “.dll” files (“.bpl” libraries). 2. Unzip these files into selected folder on your computer. 3. Run the required “.exe” file. You may manually associate “.gmv” data files (using Windows Explorer) with GMimPro and “.gmi” files with Motility to open data files by clicking on it. I am happy to answer your specific questions mashanov@mail.ru but, please, read the help files (.pdf) (and corresponding publications) first. GMimPro is an image sequence processor designed for automatic single particle/molecule detection and tracking. It can track up to 10000 objects for up to 10000 frames. You can use ImageJ Plugins to convert your data files into GMimPro format (“.gmv”) or import RAW data files in GMimPro (File/Import Data). You can export the results of tracking or other measurements using “.txt” or “.gmi” data format. See Biophysical Journal, 2007 publication for full description of the employed algorithms. GMcellModel is a computer model simulating mobility and binding kinetics of the single fluorescent molecules (both cytoplasm and membrane associated) in a virtual cell. It generates a sequence of images (8-bit “.bmp” or “.gmv” format), each containing summed images of all fluorescent objects emitting light under given illumination conditions with realistic levels of noise and emission fluctuations. These sequences can be analysed by GMimPro or other imaging software (e.g., ImageJ). You can load few basic scenarios (downloaded folder GMcellModelScenario) and run the model to test it. See JRS Interface 2014 publication for full description of the employed algorithms. Motility is a satellite software designed for statistical analysis of tracking data (.gmi) generated by GMimPro. You can add many individual “.gmi” files together and create distributions of: intensity, mobility, velocity, and other paprameters. You can create plots of average intensity, mobility, and "distance from the origin" versus time, generate MSD versus dT plots, and others. You can apply thresholds to separate slow-fast, dim-bright, short-long lived objects, and so on. The graphs can be printed, saved as “.bmp”, and exported as “.txt” files for future analysis or publishing. ImageJ plug-ins are written by Dr. J.E. Molloy (The Crick Institute, UK). 4. Use“GMV Writer” in “Plugins” menu to save your data as “.gmv” file. Alternatively you can save your data as RAW data file and use File/Import Data in GMimPro to convert data into GMimPro format (".gmv"). Modelled Data - Few samples of GMcellModel output (.gmv files) made in different conditions. GMcellModel - interaction of moving membrane molecules with "lipid rafts"
Mashanov, G.I., Tacon, D., Knight, A.E., Peckham, M., and J.E. Molloy. 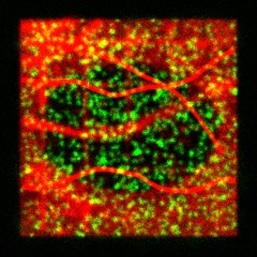 (2003) Visualizing single molecules inside living cells using total internal reflection fluorescence microscopy. Methods, Academ. Press., 29:142-152. Mashanov, G.I., Tacon, D., Peckham, M., and J.E. Molloy. (2004) The spatial and temporal dynamics of pleckstrin homology domain binding at the plasma membrane measured by imaging single molecules in live mouse myoblasts. J. Biol. Chem., 279:15274-15280. Mashanov G.I., Molloy J.E. (2007) Automatic detection of single fluorophores in live cells. Biophys.J., 92:2199-2211. Nenasheva T.A., Carter T., Mashanov G.I. (2012) Automatic tracking of individual migrating cells using low-magnification dark-field microscopy. J. of Microscopy, 246:83–88.